Actvity Summary: Students highlight these elements in a reading about a marine microbial biochemist named Beth Orcutt to learn how she conducted her science. Students are then introduced to the Science Flowchart and plot the steps Beth took to see an example of how science is a non-linear process that involves creativity, new invention, collaboration, and more. 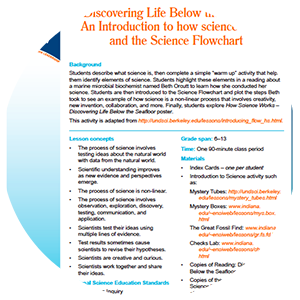 Finally, students explore How Science Works – Discovering Life Below the Sea Floor poster.